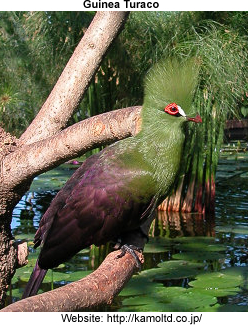 The Guinea Turaco (Tauraco persa zenkeri) prefer forested areas and savannas. They have a wide range, which includes Senegambia, Mali, Guinea-Bissau, Guinea, Sierra Leone, Liberia, Ivory Coast, Ghana, Togo, Benin, Nigeria, Cameroon, Equatorial Guinea, Gabon, Congo, South Central African Republic, western parts of the Democratic Republic of the Congo (formerly Zaire) and North-west Angola. Guinea turacos average 16-17 inches in length, from beak to tail. Their plumage is glossy and they have bold white and black markings around the eyes. The head, neck and chest is green, as is the striking crest that may have a red or purple tip. There is a ring of bright red skin around each eye. The back and tail are black with purple gloss, and the underparts are dull black. A large, crimson-red patch on each wing is visible in flight. In the wild, they eat a wide variety of fruits, and some flowers and buds. Breeding activities can be seen at the beginning of the rainy season. Each pair establishes their own territory and builds a flat nest of sticks and twigs. They usually build the nest in thick foliage 5-15 feet off the ground. Each clutch average two creamy-white eggs, which both male and female incubate for 21-23 days. The chicks usually fledge when they are 5 to 6 weeks old, but they continue to depend on their parents until they are about 4 months old.